Home > News > Heathrow expansion "right place, wrong price"
Heathrow’s planned third runway is shown on this computer-generated image nearest to the camera. It will be built over the top of the M25 motorway. 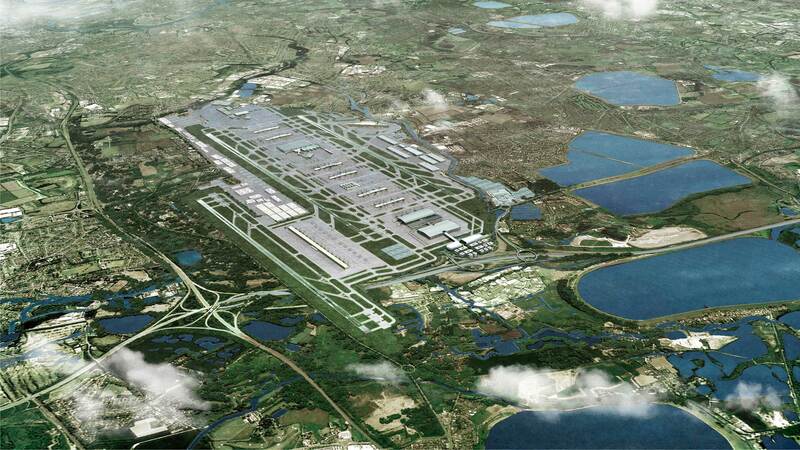 Costs could spiral out of control when London Heathrow builds its long-awaited third runway, according to the International Air Transport Association (IATA). IATA believes the location is the right one but suggests that the government consider giving the Civil Aviation Authority (CAA) greater powers to regulate Heathrow’s passenger and airline charges, and that these charges be held flat in real terms. “The airline community supports Heathrow as the right location to expand airport capacity, but has two overriding concerns: affordability, and operational flexibility,” said Rafael Schvartzman, IATA’s Regional Vice President for Europe. IATA’s report says Heathrow airport charges are the highest in the world, and that any expansion of the airport must be accompanied by a commitment that charges will not rise from the current level. “An unaffordable Heathrow will have a detrimental impact on the competitiveness of the UK’s only hub airport in comparison to rivals in France, Germany and Netherlands,” said Schvartzman. Heathrow’s own estimates for the cost of the third runway are £14-17 billion – double the price of the London Olympics. Parliament’s Select Committee says these estimates are optimistic. Key issues such as bridging the M25, access and night flights are also unclear, says IATA.